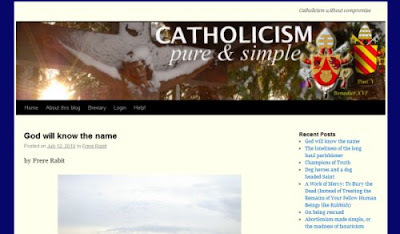 Catholicism pure & simple is a new Catholic team-blog. Already there are articles from half a dozen contributors who hail from around the globe. They include one priest. Catholicism Pure is for Catholics who love their Faith untainted by the heresy of Modernism or the implacable nature and mediocrity of the “New Church” that has emerged following Vatican II. We aim to defend and propagate authentic Catholic teaching, educate our readers about the Catholic Faith in all its “Splendour of Truth”, spread knowledge and love of traditional Catholic culture and be a lash to the backs of those clergy and laity whose quasi or actual heresy is destroying our and our children’s Catholic Faith. So far, the blog isn't as polemical as that introduction sounds; the postings cover a range of range of subjects. This morning, Frere Rabbit has a personal story from Parkminster, God will know the name.